The last stage in the DMAIC process is Control. The Control activity helps ensure your project improvements are kept on track by following the key performance measures. In a controlled system, there are goals setup to understand current position versus goal. In the control phase, it makes sense to measure key process activities and compare actual results against your goals so that action can be taken to remove the cause of variation. Standard operating procedures (SOPs) are typically used by manufacturers to document how a process is carried out. ISO accreditation forces organizations to have a Procedures Manual that acts as an SOP and, if there are any changes in operating procedures, the document must be updated. The main objective of the Procedures Manual is to demonstrate the ability to trace all components of a product back to key processes, equipment, and operators. Variables (variable data) are quantitative and measurable data. Attributes are performance characteristics that are either present or absent in the product or service. You can easily gather attribute data by counting or inspecting. However, gathering variable data is not as easy because it requires the use of some type of measuring instrument or technique. Two such techniques are run charts and control charts. Run charts are a basic control mechanism in that they show you what is happening. 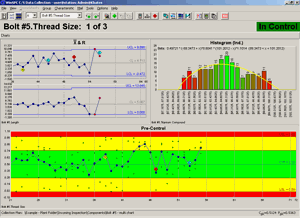 Control charts enable you to check that what is happening is within control limits. We really hope you have found this article of value and that it has inspired you to learn more about 6 Sigma and DMAIC – The Control Phase, just remember the hardest part of any journey is getting started but once begun you will learn it’s an enjoyable and rewarding experience that can improve your organization’s culture and performance in a very positive way.